How to Prepare for IPCC in Last 3 Months? 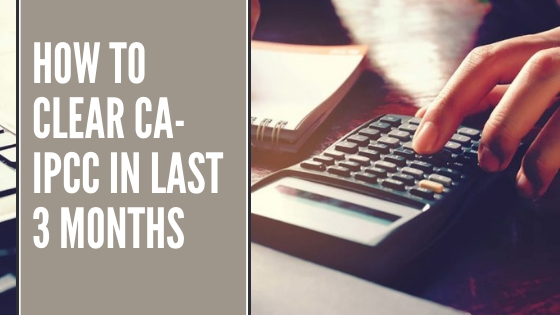 As we all know that CA IPCC is one of the most difficult exams to crack but with proper preparation and study schedule, you can make this happen. Students have a fear of CA IPCC as they have often heard from the other CA students that IPCC is difficult to crack. But this doesn’t mean that you won’t pass. Also, it doesn’t imply that the paper is unsolvable. Yes, it is pretty much solvable and everyone can solve it with a little hard work. So, here we will let to know about the best method to prepare for IPCC. Keep in mind that there will be a some situations when you will feel that you can’t pass the CA exam. But it’s all in your mind. You are the only person who can decide whether you can crack the exam or not as others will only motivate or demotivate you. Therefore, here we are going to give you tips for how to prepare for IPCC in Last 3 Months. Implement the below-mentioned tips to achieve a good rank in the upcoming CA IPCC exam. Finding the Best CA Coaching Institute plays a vital role in deciding your fate for CA IPCC exam. There are many instances when the students face issues in understanding the concepts, so in that situation, CA Coaching Institutes are the most preferred choice. Therefore, look for the most reputed CA Coaching Institute and join them immediately, if needed. This is the first thing which a CA student should do while he or she is preparing for CA IPCC. By preparing a time table, you can keep a note of things which you have already covered, and most importantly you can have a check on each and every minute of your time. Time Table is must when it comes to preparing for CA IPCC in the last 3 months. Prepare a chart for each subject so that you can get enough time for preparation. Study for around 14 to 16 hours daily with short power nap in between. At last, follow it strictly and you will experience that your syllabus is over in time. Also, give a slot for revision in your Time Table. The next thing after preparing the Time Table, download the latest CA IPCC syllabus from the official ICAI website and so, buy the books of recognized authors. Make sure you complete the syllabus well before the exam. Whether you join a CA Coaching Institute or not, the regular study is a must. Keep in mind that we are talking about the self-study, not about the studies which you have done in coaching. So, start studying from today before its too late. Gathering the previous year question papers is one of the most important stuff which a CA IPCC aspirant should do. The previous year questions help you in getting the idea of the type of questions, the difficulty of questions, and most importantly, the pattern of the paper to expect. Purchase the previous sample paper book from the market or you can download the last year papers from the internet. The above tips on CA IPCC exams are some of the most important things which you must do when you’re preparing for IPCC in the last 3 months. So, stay focused and don’t be afraid of the result. Be confident and give your best in the CA IPCC exam. Also, below are the time schedule to help you prepare your study timetable for CA IPCC subjects. This is a 12-hour study plan which the CA student must do in a day. Apart from this, at least 2 hours should be given for daily revision. You can add more time to this schedule for the subjects which you might find difficult. Also, as a CA student, you must build a habit to wake up early in the morning i.e 4 AM. The period of 4:00 AM to 6:00 AM is called Brahma Murat and the studies carried out during this period retains in your brain for the longer period. So, always study during this time. Hope you have the answer of how to prepare for IPCC in the last 3 Months. Interested in writing for us? We’re always looking for people who can volunteer to write for us as this is the perfect way to expose your article to over thousands impressions per month. Please submit your guest post HERE OR email info@ansacareers.com Thank you!